This was my fifth year serving as compiler of the Queens County Christmas Bird Count. This year’s count was on Sunday, 17 December. My goals for the count, as they have been every year, are to maximize participation, cover as much of our turf as well as we can, and to find a lot of birds. And, also, to beat Brooklyn, which is a personal obsession and says more about my Queens pride than anything else. I’m glad to say that we accomplished all of the goals this year. For months before the count I focused on recruitment. Though New York City has a lot of birders the weekend of the Queens count is a busy one for Christmas Bird Counts in and around the city. 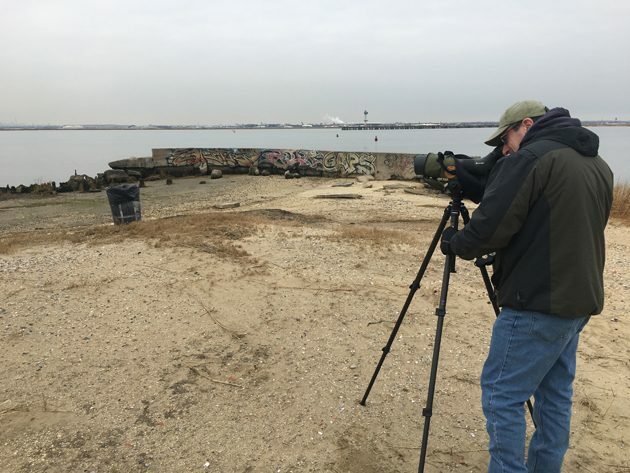 On the same day of our count is the Lower Hudson count, which covers most of Manhattan, and also the Captree count, which draws birders interested in birding the southwestern portion of Suffolk County. The day before us is both the Northern Nassau count, which overlaps the Queens circle, and also the Brooklyn count, which does the same. So with five major counts on the same weekend we are all trying to get birders to join us and some folks even do a count each day of the weekend. We ended up with forty-six participants this year, which is a pretty stellar number for a count that was down into the twenties when I started compiling. As for turf coverage, this was the second year where we had nine full sectors, with the “Flushingham” sector (the name is derived from two big pieces of their territory being Flushing Meadows-Corona Park and Cunningham Park) having been elevated from covering chunks of other sectors’ territory to being its own sector last year. They have a huge area to cover and I am thinking of creating a tenth sector in a year or two, providing we can recruit enough birders familiar with the areas to be covered, and trying to make other sectors’ areas more geographically compact. Most of our count tends to habitat-hop, meaning groups jump from park to park and rarely bird the neighborhoods in between. There are tons of pocket parks in our circle and if we covered more of them I am sure we could come up with even more good birds. We also partially reinstituted the “sweeper” system that we used for my first two years of compiling, freeing up one birder in the afternoon to try to find staked out birds that groups missed earlier in the day. Though he missed the Lesser Yellowlegs, which would go down as a count week bird, he did get quite a number of Common Grackles and American Robins coming into roost at the end of the day, which pushed both species’ numbers to our all time high count for them. Personally, I was in the Rockaways sector again, and started the morning in the Atlantic Beach subsector, the southwestern most corner of Nassau County, with Seth Ausubel and Mary Normandia. Well, actually, I started the morning in a saltmarsh well before first light, hoping for Short-eared Owls, but finding none. Instead, I managed to slip on some ice on the construction debris I was standing on and managed to soak one foot and bruise my thumb before the sun even came up. Then, I made a quick stop at a tidal creek where a lingering Yellow-crowned Night-Heron had been roosting and a Snowy Egret had been the day before. I found the former but not the latter and we would end up with Snowy Egret as a count week bird instead of a count day bird. A Merlin that flew over clutching a starling in its talons was a nice consolation prize and would end up being one of only two found on the entire count. Then I joined Mary and Seth at Atlantic Beach where the ocean was nearly as placid as I had ever seen it and we counted hordes of Red-throated Loons as well as all three scoters. Mary spotted a Razorbill flying just under the horizon and I tracked a Peregrine Falcon that ended up dive-bombing a young Snowy Owl, one of five that would be found on the count (though the one up top is an older photo), tying our all-time high set four years ago. We cleaned up on Purple Sandpiper, Dunlin, and Sanderling but couldn’t come up with anymore shorebirds and would end up missing Black-bellied Plover and Ruddy Turnstone for the count, two birds that are usually missed but should be around somewhere. Then I began the long trudge around the point while Mary and Seth drove the neighborhood and did the beach club. My walk was successful as, in addition to finding two “Ipswich” Savannah Sparrows I also flushed a large sparrow with white outer tail feathers. The second time I flushed it I was pretty sure of its identity and the third time I approached it I managed to get a look at its bold eye ring. 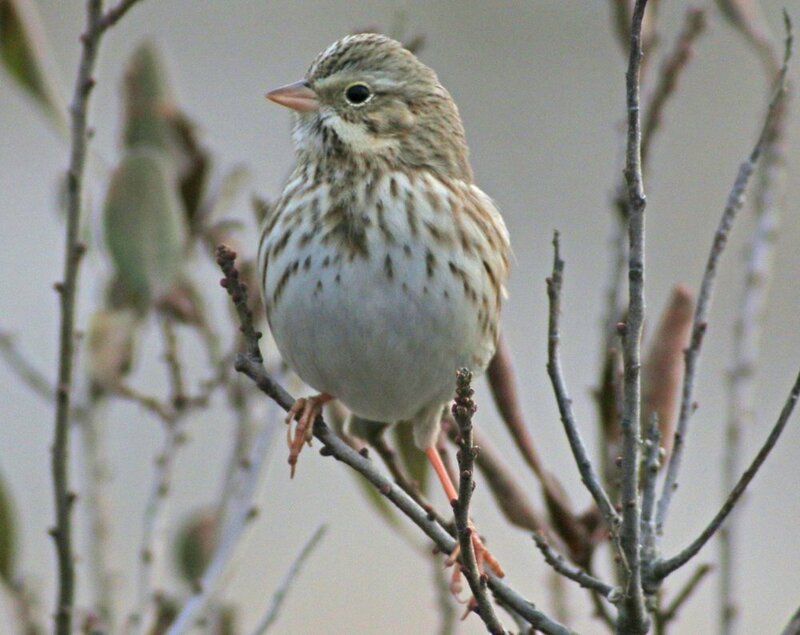 Vesper Sparrow! Now that’s a good bird for the Queens count though back in the earlier days of the count when Queens had more open country we had a high count of thirty-three, a number that we will never come close to again. My yelling, waving my arms, and probably frothing at the mouth not only alerted Seth and Mary that I was on something good but it also flushed the warbler. (Excellent field craft, thy name is Corey.) 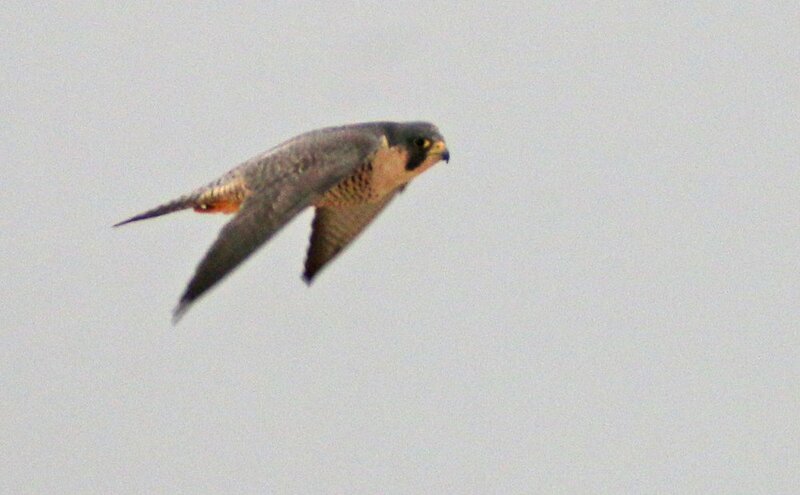 I ran back to the car, grabbed my digiscoping rig right off the tripod, and…we couldn’t find the bird. There was virtually nowhere for it to hide and it is was a bright yellow, adult male Hooded Warbler. How could we be missing it? His pronouncement did not flush the bird but a few seconds later it flew up onto an exposed perch and I managed to document it. Yes! A first ever for the Queens count! 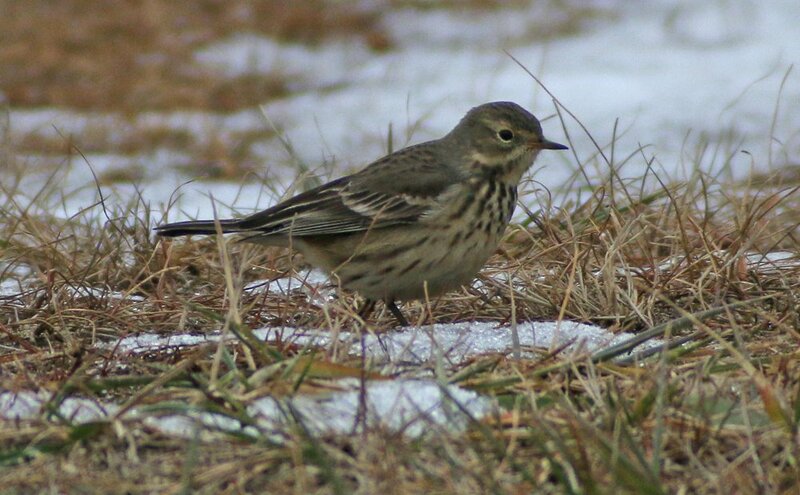 This is an absurdly good bird anywhere in the northeastern United States in December. In the car between birding stops (and sometimes during birding stops) I was regularly in touch with the leaders of other sectors, finding out what they had found and what they had missed. But, somehow, I missed the news about another wood-warbler that had been found in the Flushingham sector, a very bright Orange-crowned Warbler that created a stir when it was initially reported into eBird as a Macgillivray’s Warbler, later corrected, and then, after the count was over, changed back to a Macgillivray’s Warbler before the identity was finally settled as an Orange-crowned Warbler. Birders who had received “Needs Alert” emails for Macgillivray’s Warbler based on the initial, erroneous report, thought we Queens birders were suppressing a rarity. 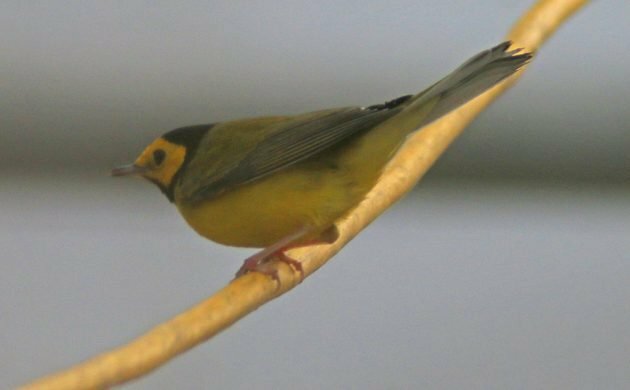 It was confusion city, especially when, in exuberation over the Hooded Warbler, I had put onto Facebook how I had found a new bird for the count. Eventually, all the confusion was cleared up but it shows how even in the days of social media and smartphones word of what birds are being seen where can still be slow to get out, at least, accurately. From Atlantic Beach we headed to Sutton Pond, a small pond in a residential area. Though the pond was almost entirely frozen and nearly devoid of waterfowl we picked up a lot of passerine activity including nice numbers of American Robins and a variety of common sparrows. It was a reminder to me that we really need to find a way to cover more neighborhoods in the count circle and not just the parks. From Sutton Pond we headed to Bayswater State Park, a windswept peninsula just across Jamaica Bay from JFK Airport. Though we tried we could not find any owls in the evergreens there though we did come across an American Pipit, not a gimme bird on the Queens Count. (Though it would turn out that Flushingham had six!) Then we met up with Jacob Drucker and Lila Freid, who had been doing the Rockaway half of the sector with Bob Deiterich, grabbed some lunch, met Bob, and all six of us headed into the wilds of the old Edgemere Landfill, once one of my favorite Queens birding spots and now mostly off limits and gated, though we manage to get access for the count every winter. It took awhile but Edgemere really paid off! An American Bittern amazed us by flushing from a mowed area that we couldn’t figure out it hid in, we found four Eastern Meadowlarks, Lila heard and then we spotted two Horned Larks flying over, and a Wilson’s Snipe flushed from thick cover. Mary picked out a Lesser Black-backed Gull and Jacob spotted a Great Cormorant. The meadowlarks, gull, and cormorant were the only ones for the count and we only had one other bittern, one other snipe, and three other larks. It was a great visit to Edgemere and I am going to have to find a way to get regular access. Then the team split up again with Jacob, Lila, and I moving on to some other points on the bay side of the Rockaway peninsula where we found nothing exciting at all. Honestly, with the first half the day we had and the visit to Edgemere we would be hard pressed to improve upon our earlier results. We ended the day with a seawatch, hoping against hope for Bonaparte’s Gull or Common Eider, both of which ended up being missed for the count. After a quick run home to change clothes and grab my laptop I headed to the Alley Pond Environmental Center for our compilation dinner. Excitement was high because nearly every group had found some good birds and I was pretty sure our total would be really impressive. I wasn’t wrong: we ended up with 123 species, one off of our record. A total lack of winter finches really hurt us, as did missing a couple of birds that had been seen in the days before the count like Wilson’s Warbler, Snowy Egret, Lesser Yellowlegs, and White-eyed Vireo, all of which would go down as count week birds. We also added Cackling Goose and Pine Warbler as count week birds so though we fell one short of our record our results indicate that with a little more luck and a little more coverage we could break 130. 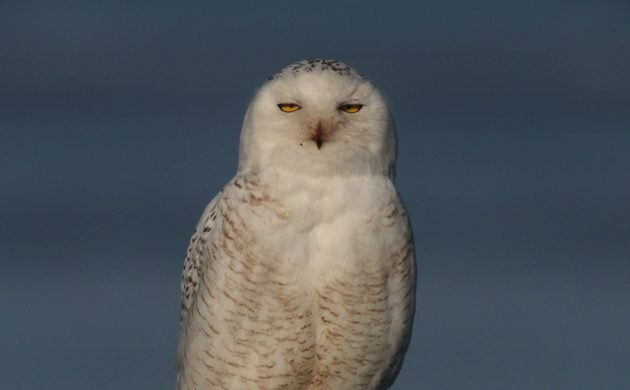 Want to help us make the 2018 Queens County Christmas Bird Count even more of a success? Leave a comment here and let me know! 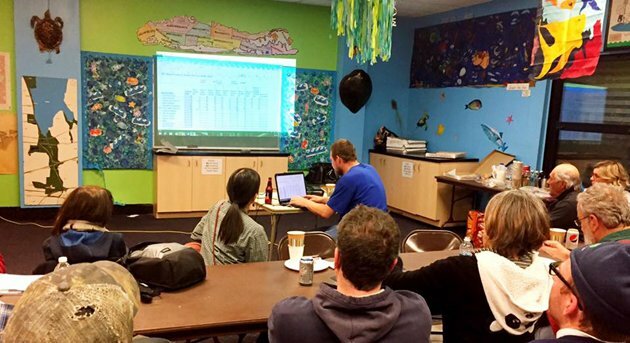 We’d love to have more birders for more coverage and more birds. Next year’s count will be on Sunday, 16 December. Oh, and we managed to beat Brooklyn yet again. That’s three years out of the four I’ve been compiling. Not bad! I love doing the Queens CBC because my territory goes through areas I knew when I was growing up here, but in such a different way. I also enjoy the strategic part of figuring out where to go in order to get the most species AND the most numbers. As my team drove through a neighborhood called Beechhurst this year, traveling from one site to another like Corey says, we chanced on a huge Common Grackle flock covering lawns and utility poles and roofs. I pulled over so my team could count and remembered one year when not one team came up with a Common Grackle! They’re often not in the parks, you have to hope that you chance on one of these flocks. Anyway, here is a photo of Richard, a stalwart member of the Coastal Flushing team, looking for birds on Little Bay, underneath the Throg’s Neck Bridge. We live in hope that one of these days Richard will find a Pacific Loon. Not easy, since by the time we get to Little Bay Park it is almost dusk, and the sun sets quickly.